A practicing physician with extensive experience in relief work on an international level, a prominent Islamist activist, and a former leading figure of the Muslim Brotherhood, Abdel-Moneim Abul-Fotouh is also known for his relatively liberal positions on social issues. Born in 1951 in Cairo, Abul-Fotouh graduated from medical school at Cairo University in 1976. He is married to Aliya Mahmoud Khalil, a gynaecologist. The two met at university and have six children, three sons and three daughters. While serving a prison term under Mubarak between 1996 and 2001, Abul-Fotouh obtained a bachelors degree in law from Cairo University. Abul-Fotouh found his way into politics, and started his decades-long political collaboration with the Brotherhood, during his university years in the early 1970s. He became the president of the students' union of the faculty of medicine in 1973 and later the president of the students' union of Cairo University as well as the secretary of the media committee for Egyptian universities. It was during this period that he famously clashed with late president Sadat. In a heated exchange, Abul-Fotouh told Sadat to his face that he was surrounded by hypocrites and took issue with the restrictions Sadat placed on demonstrations and Islamic political activity. An audio recording of the confrontation has recently found its way online and has become as a very popular YouTube video. He served in the guidance office of the Brotherhood, the highest executive body of the association, from 1987 to 2009. That year he left the guidance office after what many believe to be an internal mini-coup by hardliners against the reformist and moderate trend he represented, along with other members, such as deputy to the former supreme guide Mohamed Habib. In his two decades with the Brotherhood, Abul-Fotouh was jailed three times, for the first time under Sadat in 1981, along with 1500 politicians, intellectuals and activists in what was a major crackdown on opposition from across the political spectrum. He was later imprisoned for five years under Mubarak after being sentenced by a military court for belonging to a banned group seeking to topple the regime in 1996-2001, and again for five months in 2009. Abul-Fotouh’s views have shifted considerably over the years from ultraconservative to reformist-liberal, thus allowing him to play a key role in personally orchestrating alliances between the Brotherhood and non-Islamist factions of the opposition to the Mubarak regime in the last years of the ousted president's rule. He was involved in solidarity efforts with the second Palestinian Intifada in 2000 and anti-war efforts against the US invasion of Iraq in 2003. He was also a major figure in the pro-democracy Kefaya (Enough) movement, which emerged in 2004 and united Islamists with other activists. The movement played a significant role in building opposition to the unpopular regime of Mubarak, especially his attempts to groom his son, Gamal, to succeed him as president. Abul-Fotouh was also involved in the National Assembly for Change (NAC), which sought constitutional reform and social justice. Other prominent NAC members included former director of the International Atomic Energy Agency Mohamed ElBaradei, writer and activist Alaa El-Aswani and human rights activist George Ishaq. He also had a long career in doctors’ unions and relief organisations, both locally and regionally. His work with the Arab Union of Physicians, in particular, allowed him to develop good connections with officials and public figures on an international scale. 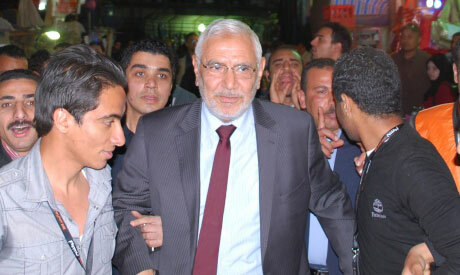 Abul-Fotouh supported the January 25 Revolution publicly from the start; he was among those who demonstrated outside the Supreme Court on 25 January before going to Tahrir Square. During the 18-day sit-in, he took part in setting up field hospitals and drew on his position as secretary-general of the Arab Union of Physicians to do so. His own son, Huzaifa, was injured twice during the course of the uprising. When Abul-Fotouh's name surfaced as a potential contender for president after the ouster of Mubarak, many young Brotherhood members immediately displayed great enthusiasm for his candidacy. He announced in May 2011 that he intended to run for the highest office in Egypt. The Muslim Brotherhood had already announced in the spring of 2011 that it would not be putting forward a candidate in the presidential elections and Abul-Fotouh was dismissed from the group in the summer of the same year on the grounds that he broke party rules. Some observers believe that conservative leadership of the organisation had used Abul-Fotouh's violation of the group's decision simply as a pretext to get rid of a figure who repeatedly challenged their views. As the battle on Mohamed Mahmoud Street near the Ministry of Interior raged between protesters and security forces in November, leaving 40 dead and hundreds injured, scores of activists collected thousands of petitions calling on Abul-Fotouh – alongside Mohamed ElBaradei and Hamdeen Sabbahi – to form a national salvation government to take charge of the country’s affairs in the place of the SCAF. The idea, however, never materialised. Abul-Fotouh, like other pro-revolution candidates, has criticised the ruling military council on a number of occasions throughout the first year of the revolution. He also declared that he believes military commanders who might have committed crimes during the transitional period should not be allowed immunity after a new president is elected. Abul-Fotouh has made gender and religious equality a central tenet of his campaign. Abul-Fotouh said, "no one would accept that either a Muslim or Copt would be privileged over one another. He has asserted that the rights and duties of every Egyptian should be based on equal citizenship rights without any discrimination based on race, gender, religion or political views. "I hate to use the word minority; Copts should not be perceived as a minority that is threatened by a Muslim majority. They are part of Egypt and, like us [Muslims], have suffered from injustice under the former regime." On women's rights, Abul-Fotouh believes that women are entitled to take up high-ranking governmental positions, even that of president. "[Should I win the presidential elections], I would consider appointing a woman or a Copt as vice-president based on competence, and not for propaganda purposes." * Abul-Fotouh's brand of Islam makes him particularly popular with the liberal-Islamist segments of the middle class and young Brotherhood members. His liberal views on Coptic and women's rights also appeal to a large number of liberal voters. Many of his supporters believe that he can potentially bridge the secular-Islamist divide in Egypt, and at the same time in the same stroke provide a non-conservative Islamist alternative to Salafists such as Hazem Salah Abu-Ismail. * His periodic criticism of the ruling military council and his rejection of a safe exit for generals resonate with many pro-revolution activists. * His years of extensive experience in the Arab doctors' union gives him appeal among voters looking for a candidate who understands regional and world challenges. * The Brotherhood’s decision to dismiss members who back Abul-Fotouh's presidential bid from the organisation may inhibit many some from voting for him. Others who may still vote for him behind the polling curtain may not campaign for him publicly given the threat of expulsion hanging over their heads. Moreover, the decision by the Brotherhood in late March 2012 to field Khairat El-Shater, the second in command in the group, in the presidential elections could add more pressure on rank and file members to veer away from Abul-Fotouh's campaign. These difficulties in counting on Brotherhood support put Abul-Fotouh at a massive disadvantage vis-a-vis Salafists such as Abu-Ismail who possess a massive human and financial campaign machine. * Many liberal, leftist and Christian voters fear that, despite his liberal leanings, are wary of Abul-Fotouh's Islamist background. Others worry that his win could aid Islamists who control the parliament in their quest to push the country in the direction of a theocracy, against the will of Abul-Fotouh.